Hate your eyebrows? Thin, sparse, unruly, disappearing? While the hair frames the face, it is your eyebrows that frame your eyes. 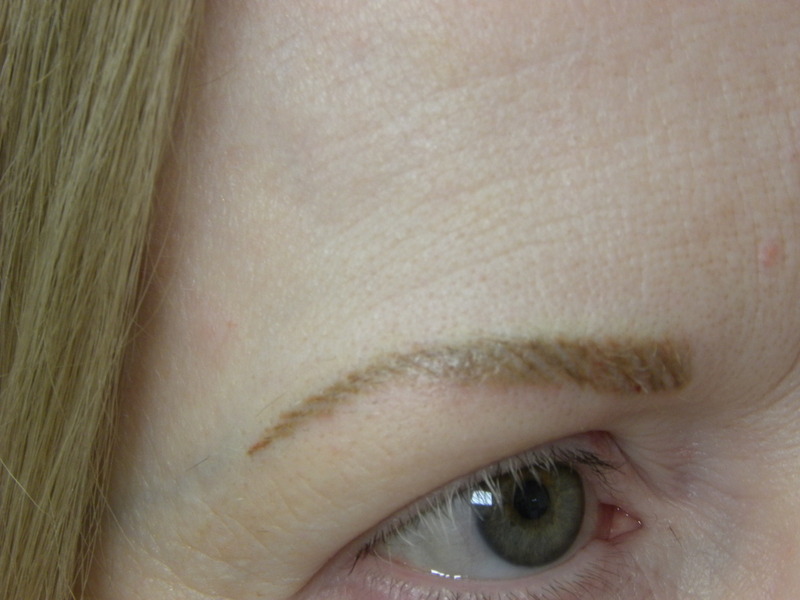 Some people naturally have thin or sparse brows. Others lose hair due to health conditions or with hormonal changes during menopause. Whatever the cause it can be frustrating and time consuming to correct. Do you find putting them on every morning a challenge? Maybe it is becoming more difficult to see to put them on? Do they come out crooked or uneven? Do your penciled brows wear off during the day? If you are experiencing any of these challenges I can help. I’ve been a makeup artist and permanent makeup technician for 30 years. Take advantage of my background and experience. Wake up every morning with great eyebrows that look natural. No one will know that you weren’t born with them. If you’re like most, even your closest friends will think your brows are “real”. I work with you to analyze your needs, your bone structure, and your personal preferences. Next, we measure and mark to make sure you have the most flattering brows possible. Since the face asymmetrical, measuring gives the best results. 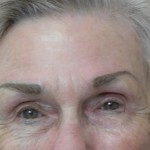 You deserve brows that will look great today and age gracefully with you. 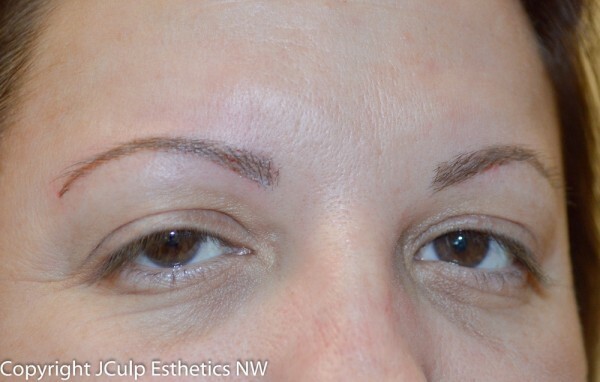 Whether you need sparse brows filled, missing spaces filled, or a total brow creation, I can take care of you. 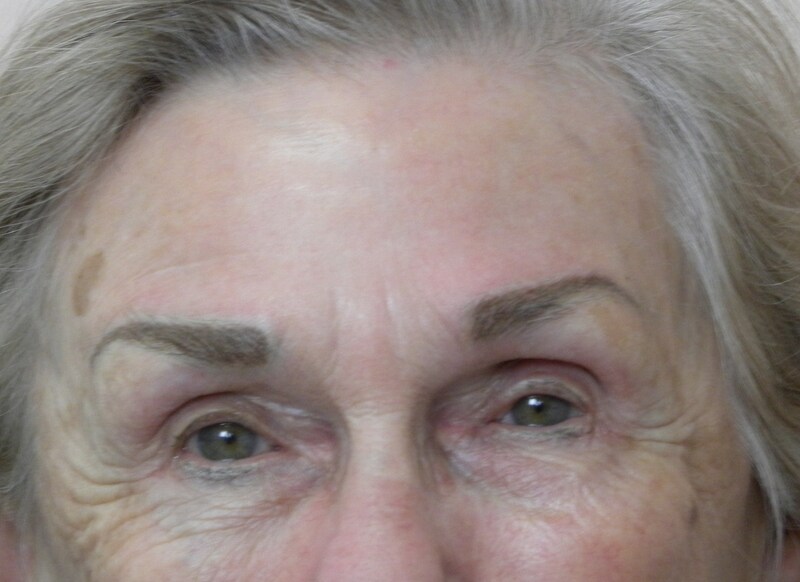 There are different styles and shapes of brows. Your own bone structure tells me how your brow should ideally be shaped. We let your bones guide the way to assure the prettiest brow. Brows that flatter your face and eyes. There are also different coloration techniques. Powdery filled brows are softly filled in and have very good staying power. They are like you’ve used a bit of makeup powder to fill them in. Hair stroke techniques are designed to simulate individual hairs. These require the most frequent maintenance. And there are combinations of the two techniques. I use your individual skin and personal preferences as a guide to the best choice. We will select a color based on your natural color pallet. Blonde, brunette, redhead, graying. Since many of us color our hair, I don’t try to do an exact hair match. I use any existing eyebrow hairs as a guide. I also look at your skin undertone and how fair or intense your skin tone is. We may use a single tone to start or we may use multiple shades. It all depends on our goals. 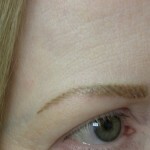 For those with alopecia, (lack of hair), we use your skin tone and build a brow that will be flattering. The shades that make up brown colors are probably the most fragile in the tattoo pigment family. They are not the intense primary colors of traditional tattooing. Because of this, they tend to fade more quickly than the colors used for body art. I recommend protecting your eyebrows by wearing SPF on a daily basis. Many things can affect the color last. This includes UV exposure, lifestyle, health issues, medication and more. Over time the pigment bleaches and appears faded. Some people think their tattoo went away. No, it got bleached by UV. We recommend a re-enhancement when you notice fade. Typically our clients get a re-enhancement every 2-5 years. This treatment is a single visit. We just refresh the existing color. Re-enhance is half price. 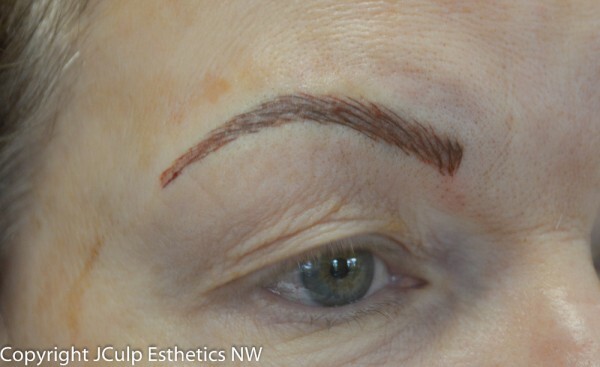 Permanent cosmetics are less expensive than Botox – and last years instead of months. 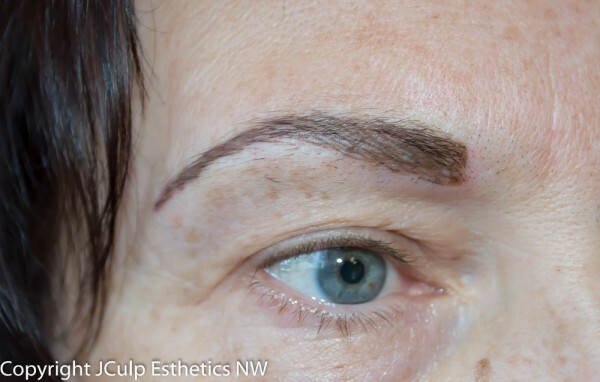 Corrective pigmentation to “fix” or repair previous work is typically more challenging. It may require multiple visits. I need to meet with you for a consultation to see what you have. Together we develop a plan to help you get where you want to be. Fortunately, new quality pigments have been in use for over a decade. We don’t see the odd undertones that plagued the industry in its early years. 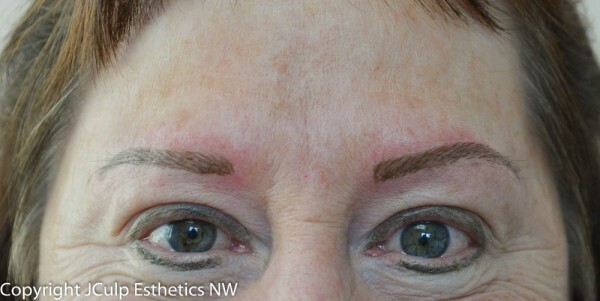 Your brows just soften to a lighter shade of the color I implant. You may use your credit card to secure your appointments. Please call in advance if you need to make a schedule change. This will prevent a no-show fee charge. Consultations: $75 – fee 100% applied to service appointment within 60 days. Consultation plus same appointment service $200 fee 100% applied to appointment service. New eyebrows, or starting over takes 2 visits and is $600. The follow-up visit is free. If you no show, we will happily reschedule your appointment but a $100 fee will apply. 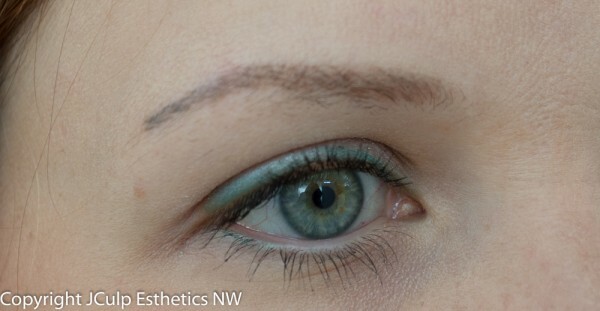 A re-enhancement is a color pick-me-up and is a single visit. $300. Corrective work – pricing quoted during our consultation when I can see and evaluate your need. Call me at 541-344-7789 or on my cell 541-543- 3070 for more information. For tips about the procedures, please visit here.